O Almighty God, who by thy Son Jesus Christ didst give to thy Apostle Saint Peter many excellent gifts, and commandedst him earnestly to feed thy flock: Make, we beseech thee, all Bishops and Pastors diligently to preach thy holy Word, and the people obediently to follow the same, that they may receive the crown of everlasting glory; through Jesus Christ our Lord. Amen. O God, who, through the preaching of the blessed Apostle Saint Paul, hast caused the light of the Gospel to shine throughout the world: Grant, we beseech thee, that we, having his manifold labours in remembrance, may show forth our thankfulness unto thee for the same, by following the holy doctrine which he taught; through Jesus Christ our Lord. Amen. Artwork: Bartolmeo Vivarini, Sts. 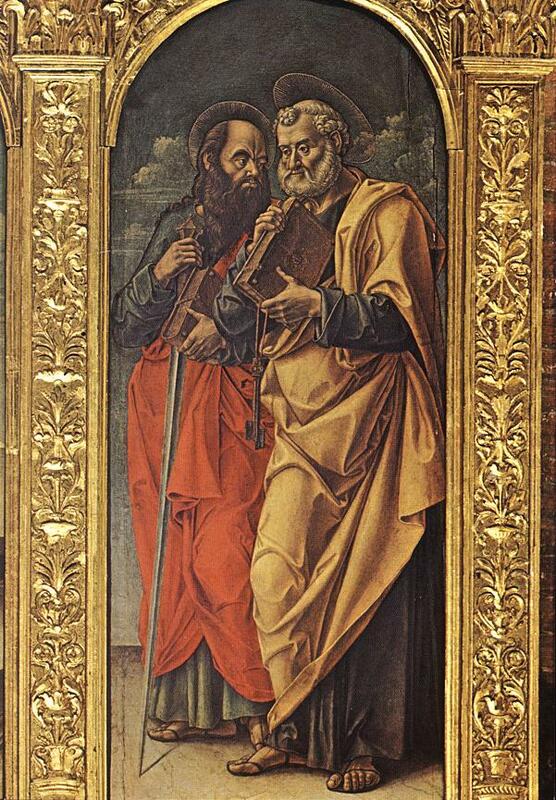 Peter and Paul, 1482. Panel, Santa Maria Gloriosa dei Frari, Venice. O Lord, we beseech thee mercifully to hear us; and grant that we, to whom thou hast given an hearty desire to pray, may by thy mighty aid be defended and comforted in all dangers and adversities; through Jesus Christ our Lord. Amen. 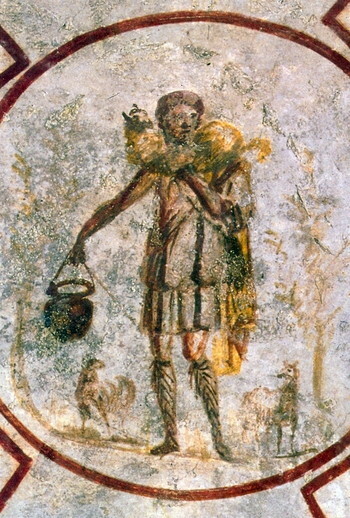 Artwork: Jesus as Good Shepherd, c. 250. Fresco, Catacomb of St. Callixtus, Rome. Almighty God, by whose providence thy servant John Baptist was wonderfully born, and sent to prepare the way of thy Son our Saviour, by preaching of repentance: Make us so to follow his doctrine and holy life, that we may truly repent according to his preaching, and after his example constantly speak the truth, boldly rebuke vice, and patiently suffer for the truth’s sake; through Jesus Christ our Lord. Amen. Artwork: Giusto de’Menabuoi, Naming of the Baptist, 1376-78. 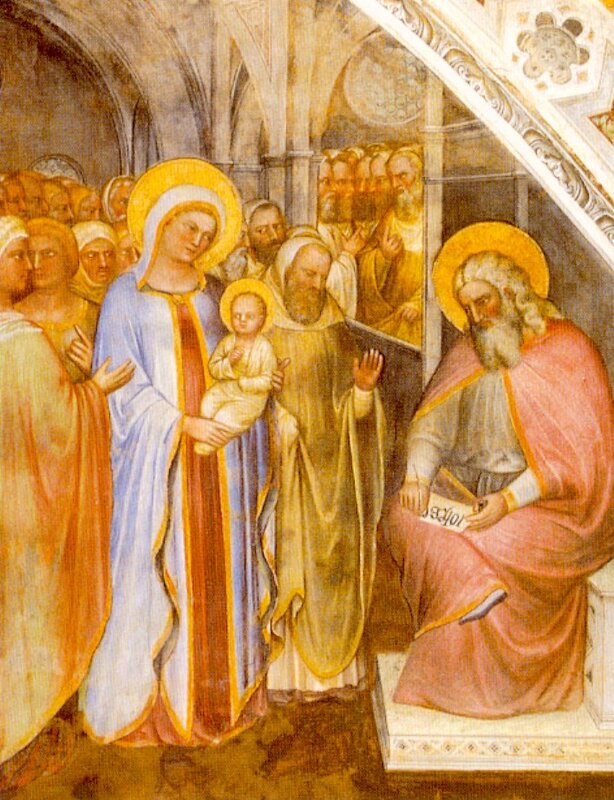 Fresco, Cathedral Baptistery, Padua, Italy. (Fr.) David & Marilyn Curry will be away June 24th to July 1st for Elizabeth’s graduation from Cambridge, England, the week of June 28th and, then, on vacation during the month of July. (Fr.) Tom Henderson (798-8921) will be priest-in-charge and will take the Sunday Services. Fr. Curry will be priest-in-charge for the Parish of Avon Valley during Fr. Henderson’s vacation. O Lord, we beseech thee, let thy continual pity cleanse and defend thy Church; and because it cannot continue in safety without thy succor, preserve it evermore by thy help and goodness; through Jesus Christ our Lord. Amen. Almighty God, by whose grace and power your holy martyr Alban triumphed over suffering and was faithful even unto death: Grant to us, who now remember him with thanksgiving, to be so faithful in our witness to you in this world, that we may receive with him the crown of life; through Jesus Christ our Lord, who lives and reigns with you and the Holy Spirit, one God, for ever and ever. There is more to the Christian religion that mere good manners. And yet good manners have in them more, perhaps, than we realize. More than just an aspect of civilization in the form of considerate behaviour, “manners maketh the man” and reveal something of our intrinsic character and nature; in other words, there is something of the charity of Christ at work in our dealings with one another. And that is, of course, a central theme in the Trinity season. To put it bluntly, we participate in what is proclaimed. “God is love and he that abideth in love abideth in God and God in him,” as we heard last week from this same Epistle of St. John. There is a necessary, inescapable and intimate relation between the making known of God in Jesus Christ and the form of our life in Christ. St. John, in the Epistle reading for today, drives home a very hard lesson that follows from that understanding. It is about our love towards even our brother towards whom we may feel anything but love and affection, kindliness and concern. There may be things about our brother or sister (let’s not be gender exclusive!) that is quite unlovely, even hateful. What, then, are we called to love in those whom, quite frankly, we can’t stand? Simply this, we honour their being made in the image of God as we are, howsoever much that image has been obscured, denied and derided, or howsoever much we ourselves may be confused and deluded in our judgment. This provokes the equally salutary thought. Our awareness of our judgmentalism leads to self-judgment. That can be quite destructive; self-condemnation leading to despair. In relation to that, there is the strong teaching that “if our heart condemn us, God is greater than our heart.” In every way, we are being encouraged, if not actually catapulted into the mystery of God which we have been privileged to hear and receive. We are confronted with a challenge and a refusal. There is the challenge to act out of what we have been given to see of the majesty of God. Such is the vision of the Trinity. “Behold, a door was opened in heaven,” as we heard last Sunday. It is a door, not a window, a door through which we are invited to enter. We are invited into the vision so that the charity of God may shape our lives into holiness. But then, there is our refusal to will that order and truth, preferring, instead, the vanity of ourselves that blinds us to the real needs and even the very presence of others. We ignore Lazarus at our feet. What has he to do with us? we may think. But in so neglecting Lazarus, we are really neglecting God. We deny the love of God made visible in Jesus Christ. In denying the poor man at our feet, we deny the God in whose image we are all made. The love that is shown is the love that is to be lived. The Epistle teaches us that love is of God because God is love. That love is manifested in Jesus Christ so that we might live in love through him. The only question is whether we will live the vision. And so the Epistle sounds the theme and the Gospel gives the crucial illustration about our relationship to the vision of God revealed as Trinity. The Epistle is St. John’s treatise about that love. The Gospel is St. Luke’s powerful story of the Rich Man (Dives) and Lazarus. What does it come down to? Simply this. The love of God compels us to love one another. This is not a may-be, but a must-be for our salvation. We are commanded and compelled to love out of the vision of love which has been shown to us. When we ignore the stranger in our midst or neglect the beggar at our door, then we deny the God who “became poor for [our] sakes” and who “came into our midst”. When we are consumed by envy at the good fortune of others, when we filled with hatred and wrath for hurts and injuries inflicted upon us, whether real or perceived, then we place ourselves very far from God and do great harm to ourselves. To put it in terms of the parable, there is a great gulf fixed between us and God when we ignore the poor man at our gate, the neighbour close at hand, and, by extension, the stranger far away. Then we place ourselves in torment, the torment of our self-willed distance from God. We create the abyss that separates us from God and from one another. Wow! Here you are! Look at you! All dressed up – again – and everywhere to go! We salute you for your accomplishments. Today you are the pride of the school, the pride of your parents and grandparents, your relatives and friends, your cultures and communities. There is always something just a little overwhelming about these occasions; a day super-charged with so many emotions. We are both sad and glad to see you go! You meet for the last time here this morning as students of King’s-Edgehill School. In a short while you will step up and step out as graduates. You have made the grade and are about to step into a whole new set of relationships. Such is graduation. You do so because of the things that have belonged to your time here whether it has been for one year or for six. It has been the place of your abiding, to strike the note in the lesson which Ashley read. This is the place where you have lived and learned – sometimes, no doubt, the hard way (let’s not go there! ), sometimes not! And perhaps, some of the lessons have yet to take root, let alone to bear fruit, in you! Together we have been through a lot. We have laughed and sung together – well, at least we’ve tried! We have cried and grieved together, known suffering and loss and sorrow together as well as joy and delight. We have experienced the agonies of defeat and the ecstasies of victory. It is almost as if you have already lived several lifetimes, so intense and busy everything has been. And there have been the quiet times of reflection and meditation, too; in sum, the hard lessons of thinking and acting beyond yourselves. All these things enter into the making of who you are. They are part of the formation of character; they belong to the shape of your being. But only because you have embraced the challenges and the responsibilities that have been set before you. Not always willingly perhaps. After all, there are many things that we don’t like doing, many things that we kick against and rebel. It is called adolescence and it lives on in all of us, as arrested, atrophied or simply extended. It reaches back to the old, old story of humanity’s rebellion against the limits and the restraints that properly define freedom. We have rehearsed that story many times both in what has been read and heard but also in the awareness of what we have all done, “by thought, word and deed”, as it were. And yet, that is all part of the larger story of human redemption and the hope of transformation.